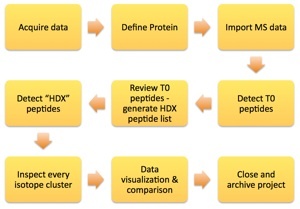 WE HAVE STANDARDIZED A COMMON WORKFLOW FOR HDX DATA ANALYSIS. THE WORKFLOW BEGINS AT THE DATA ACQUISITION PHASE, AND ENDS WITH FINALIZING AND ARCHIVING THE DATA. IN THE FOLLOWING TUTORIALS WE WILL WALK THROUGH THE WORKFLOW USING THE FIGURE ABOVE OUTLINING HOW EACH STEP IS ACCOMPLISHED USING THE SOFTWARE. USE THE ARROWS BELOW TO NAVIGATE THE WORKFLOW TUTORIALS.